Although Christopher Gunning is best known for his film and television work, for which he has won four BAFTA awards (for La Vie en rose, Agatha Christie's Poirot, Middlemarch, and Porterhouse Blue) and three Ivor Novello awards (for Rebecca, Under Suspicion, and Firelight) he has gradually been adding to a substantial is of concert works, to which he now devotes all of his time. Christopher Gunning attended the Guildhall School of Music and Drama, where his tutors included Brian Trowell, James Gibb, Edmund Rubbra and Richard Rodney Bennett. His compositions for the concert hall include nine symphonies and a number of concertos. "Although I have often thought of writing a Violin Concerto, it was 2011 when I first felt the time was right. Then in 2012 I climbed the beautiful Sugarloaf Mountain near Abergavenny full of ideas for the piece; it would be predominantly lyrical and melodic but also quite florid, with the violin ducking and weaving, rather like the insects and birds of the Welsh hills and valleys. The Cello Concerto is quite different. Although composed hard on the heels of the Violin Concerto, it is generally darker though equally expressive." " Harriet Mackenzie's expressive playing makes Gunning's sinuous solo line sing like a bird in his unashamedly lyrical celebration of the landscape in the Brecon Beacons. It's instantly accessible, warmly melodic yet never trite or cloying (the first movement is a gem, built around a single chord). The cello concerto is grittier, exploring dark themes of ageing and loss. Richard Harwood brings a stately gravity to the sombre nature of the work." 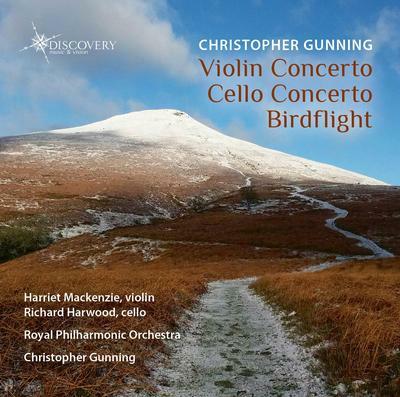 What do you want to know about Christopher Gunning Violin Concerto Cello Concerto Birdflight?